Salvage Barge: Built in 1884 at City Island, NY; Acquired by the Navy in 1918; Placed in service, (date unknown); Placed out of service, (date unknown); Returned to her owners, the T. A. Scott Wrecking Co., New London, CT; Struck from the Naval Register, (date unknown). Fate unknown. Specifications: Displacement 179 t.; Length 113' 2"; Beam 29' 4"; Draft 5' 9"; Speed non-self propelled; Complement 10; Armament none. 73k Photographed prior to her World War I naval service, with name on her bow apparently shortened to just "Addie". 78k Photographed prior to her World War I naval service.. 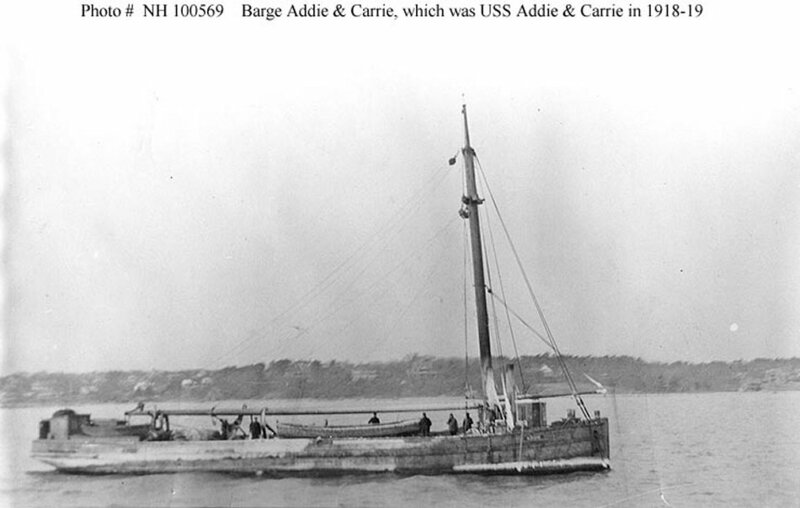 Dictionary of American Naval Fighting Ships: Addie and Carrie—a wooden-hulled, non-self-propelled barge built in 1884 at City Island, N.Y.—was inspected in the 2d Naval District on 30 July 1918 and, on 6 September 1918, was ordered to be taken over by the Navy. A letter was accordingly dispatched to her owners, the T. A. Scott Wrecking Co. of New London, Conn., on 9 September and the craft was acquired by the Navy shortly thereafter. Designated Id. No. 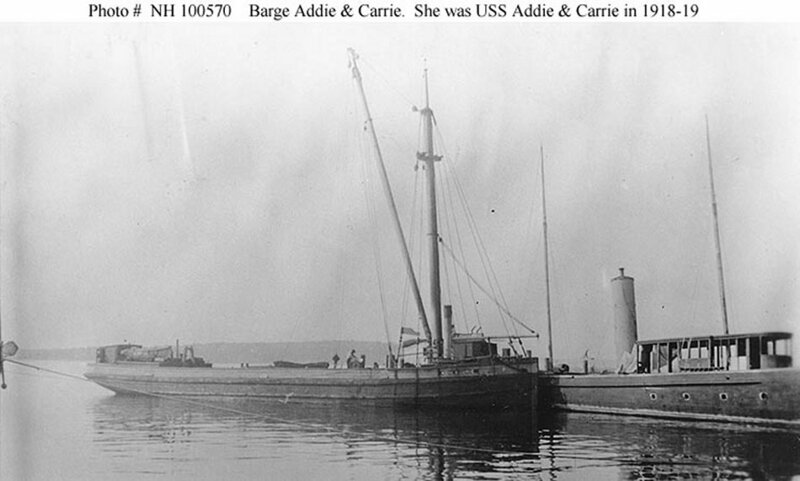 3226, Addie and Carrie—sometimes referred to in dispatch traffic as merely Addie—served as a salvage barge attached to the Salvage Station, New London, through the end of hostilities and up until the termination of all Navy salvage activities of privately owned vessels was ordered discontinued on 15 May 1919. Five days later, Addie and Carrie was returned to her prewar owners for a resumption of civilian pursuits.